This memo addresses questions of corporate responsibilities and accountability for human rights violations in cases of corporate restructuring and splits when the spun-off companies become separate legal entities, rather than subsidiaries, of the mother company but still retain its corporate brand. The BDS movement has seen multiple examples of corporations engaging in restructuring, often splitting into two — or more — companies sharing one brand, due to BDS pressure or other financial factors. Motorola has split into Motorola Mobility and Motorola Solutions; Hyundai into Hyundai Motor Company and Hyundai Group; Volvo into Volvo Cars and Volvo Group; and the most recent example which will be addressed briefly in this memo is Hewlett Packard (HP Co.). New companies created through corporate splits often retain the corporate brand of the mother company because brands are valuable assets. Well-known brands are valued at billions of dollars. As of May 2017, for example, Forbes listed Hewlett-Packard (HP) as the 42nd most valuable brand in the world, valuing the HP brand at $13.2 Billion. When a corporation that violates human rights splits up into two or more companies that retain and share its corporate brand, do any or all of these new companies bear responsibility for those earlier violations? Do all companies that share the same corporate brand bear responsibility for the human rights violations carried out by one of them? Can they all be held accountable? In general, brand-sharing by legally separate companies — assuming this separation is verifiable — does not result in shared or collective responsibility for violations of international humanitarian law (IHL) and/or human rights committed by one or some companies carrying the same brand name. Corporate responsibility rests with the company committing the violations. The onus is on each company to demonstrate to the public that it is free of illegal and unethical business activities. The public does not have to — and usually cannot — identify which of the new companies emerging from corporate restructuring has inherited illegal/unethical business from the former mother company. Consumers and investors, for example, may thus hold all companies sharing the same brand accountable for human rights abuses committed in the name of the brand, unless a company provides unambiguous evidence showing that it operates in conformity with IHL and human rights. Companies sharing the same brand have not only the legal duty but also a business interest in providing unambiguous evidence showing that they operate in conformity with IHL and human rights. Failure to do so entails a risk of reputational damage to the brand, and of consumer boycotts affecting all companies sharing the same brand because their products/services are perceived as originating from one and the same source by the public. The blurring of perceptions is intentional by companies sharing the same brand so that they can together extract maximum profit from the good reputation of the brand. But the reverse is also true. When a shared brand is associated with human rights abuses both companies may suffer costs because of the shared brand, even if only one of the companies is associated with the violations. Individual responsibility for involvement in war crimes and flagrant violations of human rights remains after corporate restructuring and dissolution of the mother company. Owners and CEOs of the mother company are accountable and legally liable. In situations where such individuals also own or manage a new company created through a corporate split, this may entail business risks for the respective successor company. Hewlett Packard (HP Co.) has split into Hewlett Packard Inc. (HP Inc.) and Hewlett Packard Enterprise (HP-E). In the spring of 2017, HP-E merged with Computer Science Corporation (CSC); subsequently, portions of what had been CSC and HP-E were spun off to form a new global IT service provider, DXC Technology (DXC). Post restructuring, HP-E continues to provide the servers upon which the Israeli government’s population registry is stored. This population registry is a key part of Israel’s apartheid regime that has fragmented the Palestinian people into exiles and refugees without status and rights in their country, second class citizens of Israel (discriminated against by more than 60 racist laws), and Palestinian “residents” — not citizens — in the occupied Palestinian territory (OPT), including East Jerusalem, under Israeli civil and military law. HP Co., the dissolved mother company, had a contract to exclusively provide computers to the Israeli military through 2017 with an option to extend for two years. Given that consumer products went to HP Inc. after the split, it is likely that this contract went to HP Inc. Both of the new companies sharing the HP brand have yet to provide unambiguous evidence demonstrating that they do not violate IHL and Palestinian human rights in their business activities with Israel. Neither HP-E nor HP Inc. has responded to multiple requests for clarification of the current status of the former mother company’s complicit business with the Israeli military and government in the wake of the split. Neither corporation has provided evidence that it does not maintain business relationships with Israeli entities which directly or indirectly violate IHL and Palestinian human rights. 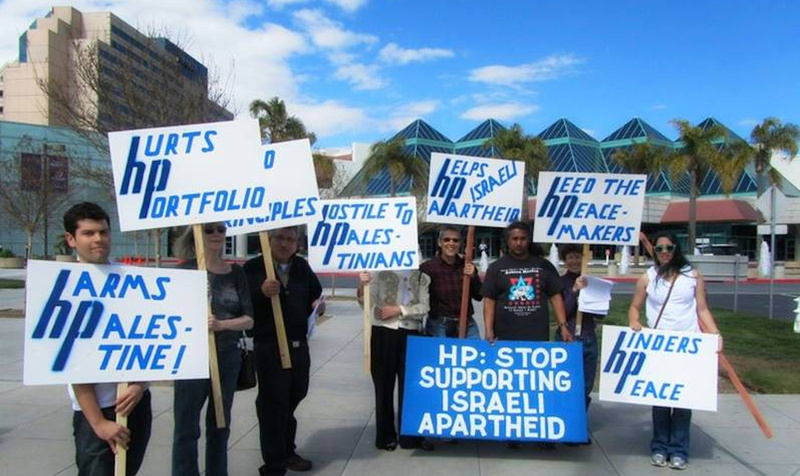 Until both companies do so, human rights advocates and campaigners, including in the BDS movement, can and should hold both HP-E and HP Inc. accountable for human rights abuses committed in the name of the shared brand through boycott and divestment actions. Individual responsibility for the well documented violations of IHL and Palestinian human rights by the former mother company (HP co.) remains with the latter’s CEO Meg Whitman and the board at the time of the corporate split. CEOs and board members of the successor companies HP-E, HP Inc. and DXC are legally responsible and accountable for IHL and human rights violated in the conduct of their respective business activities with Israeli state or private entities.